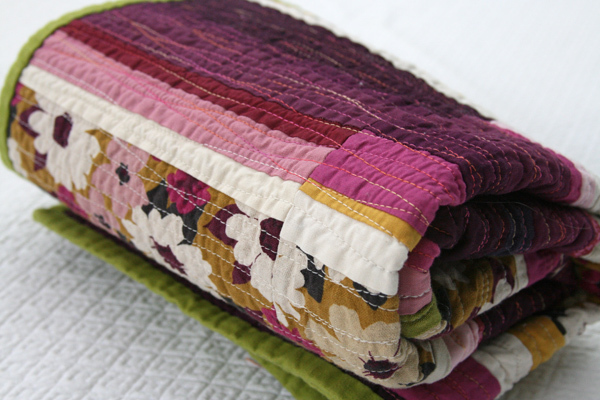 A fabulous print fabric is often the jumping off point for an even more fabulous quilt. Whether we’re working with one great print, a collection of coordinating prints, or a combination of prints pulled from various places, quilters today have an amazing array of print fabrics at our disposal. For the next 7 days, we’ll take a look at 7 quilts that make excellent use of print fabrics. Welcome to the week of prints! The variety of print fabrics in Mary Claire Allen’s Sunrise Sunset quilt is set off by a gorgeous array of coordinating solids. 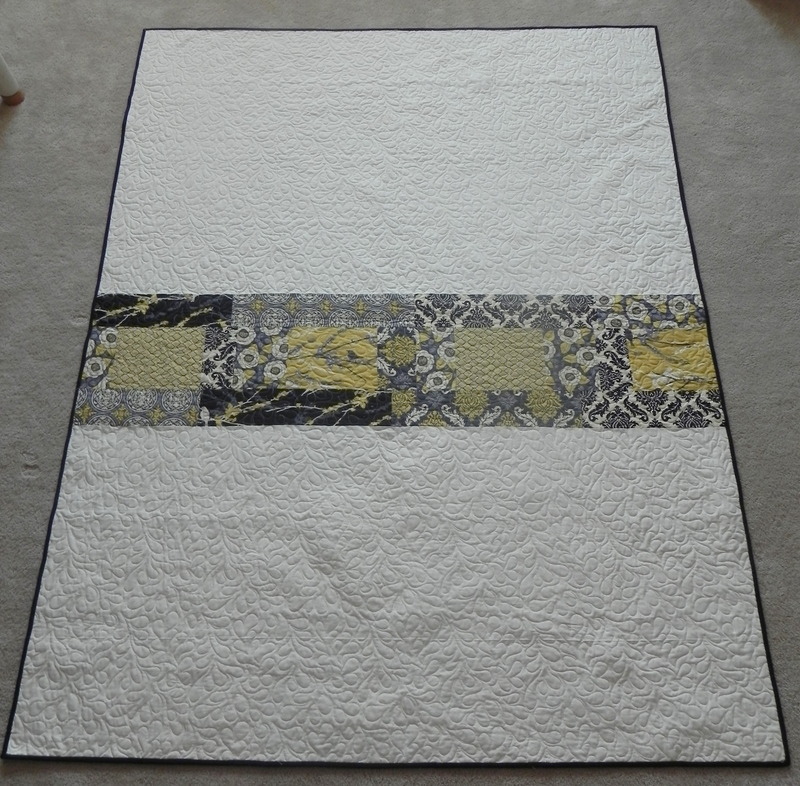 “I’m a Midwestern sewer/quilter and a member of the St. Louis Modern Quilt Guild. I’ve been sewing little bits off and on for probably close to 20 years, but really got serious three or four years ago. Quilting, and especially the Modern movement, captures my interests and predispositions better than any other hobby I’ve tried; I’m hooked! You can see more of Mary Claire’s work on her blog, Splendorfalls. Sarah Brazier used bold print fabrics to bring a new look to a familiar flag. “This quilt was inspired after my 2 1/2 year stint in England and I wanted to make something funky for my British pseudo step daughter It took a lot of trial and error and about a year of trying, some errors of which I blogged about it.. many that I didn’t.. when I finally got the right combination I was over the moon. I just simple adore the flag and the history behind the Union Jack. I’ve got another one already on the way to being made out of softer Moda fabrics. You can read more about Sarah and her pattern at The Aftercraft. Sara Soelberg combined monochromatic prints to create the fun and graphic X and O shapes in her Tic Tac Toe quilt. 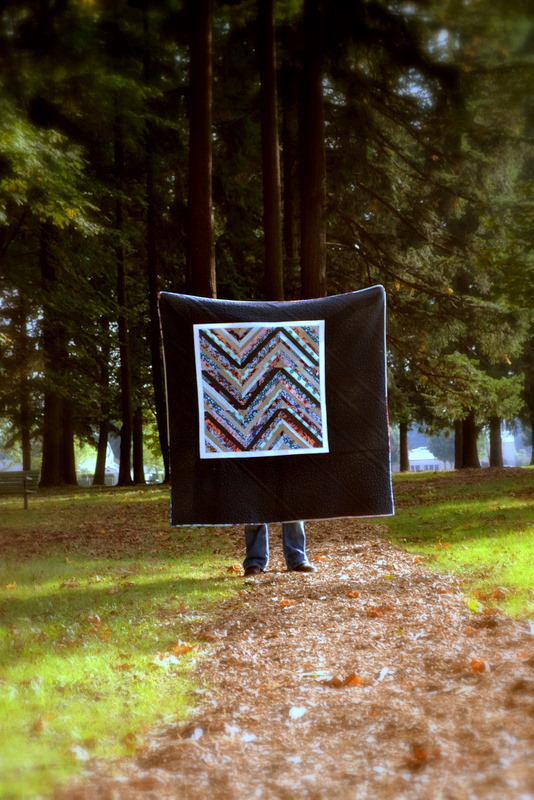 “This quilt was inspired by a whole lot of ‘X’s floating around in blog land this past winter. Every time I saw one (like Sew Mama Sew’s Urban Hug Pillow), it screamed tic-tac-toe to me. My sweet sister in law was having her third baby (second boy), and I wanted to celebrate his arrival with something fun. 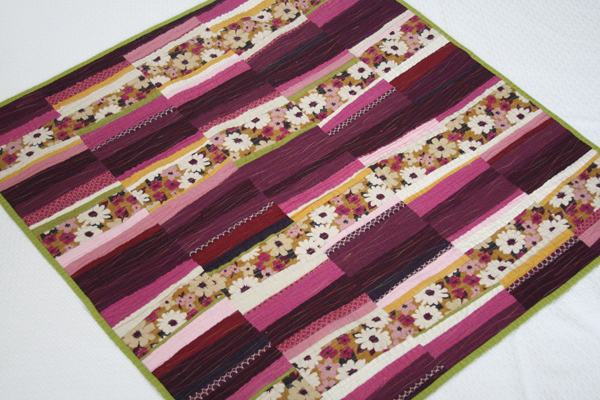 To me this quilt is modern, because it has such bright colors, mixed prints, and a bold design. For the quilting I did a simple stipple — my very favorite stitch. You can see more of Sara’s work in her Flickr stream. A white frame and charcoal negative space highlight the patchwork-pieced print fabrics in Heather Bostic’s Interstate Love Song quilt. “I wanted to create an edgy/ urban quilt expressing my admiration for my husband. It only made sense to use Anna Maria Horner’s Innocent Crush fabric line with my masculine chevron design, keeping romance without the frills. Add to that the fact that my Long Arm quilter, Angela Walters, then quilted into the quilt the lyrics to Stone Temple Pilots Interstate Love Song (our song)… and I think you get perfect image of two young kids falling in love in Portland, OR. Heather lives in Portland, Oregon, with her husband and two sons. 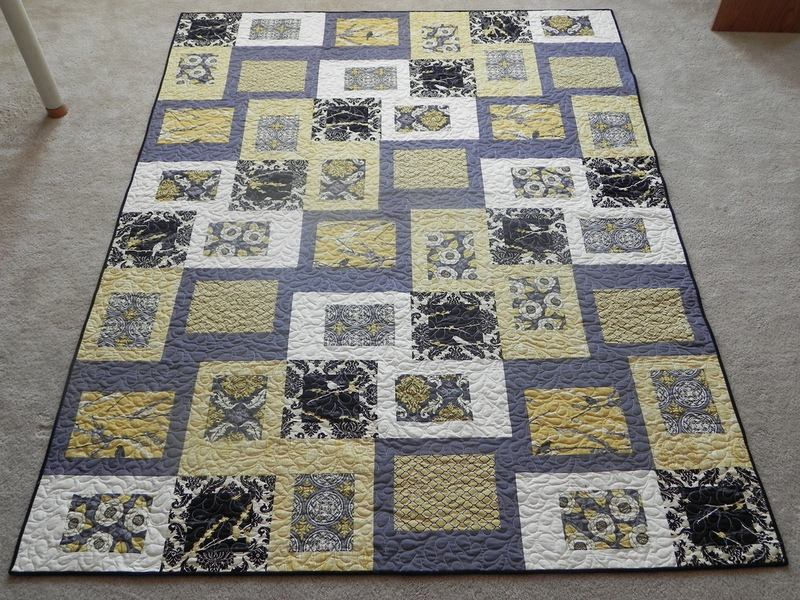 Read more about her many sewing and quilting projects on her blog (music with link). Kelly Miller’s Modern Rubiks quilt, based on a design by Ashley Newcomb, features large and small areas of print fabric. The negative space surrounding the smaller pieces of print fabric keeps the composition from getting too busy. Here’s what Kelly had to say about herself and her quilt. 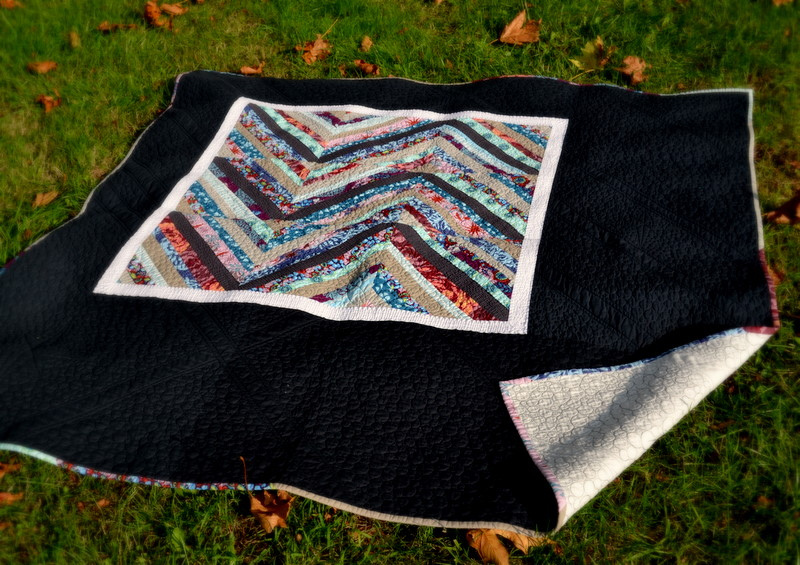 “I got my inspiration for this quilt from Film in the Fridge’s blog. 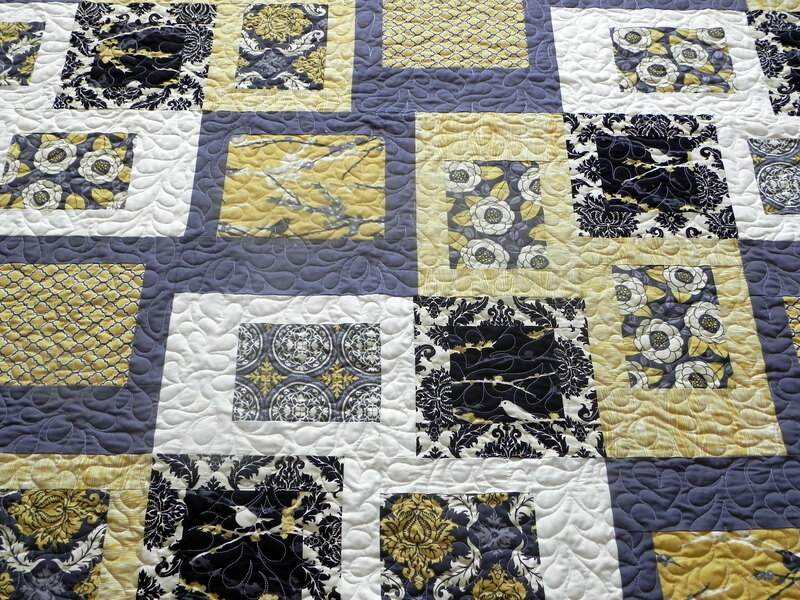 The quilting for this quilt was done by Melissa Riche – the President of our guild, and a friend of mine. Erin Weber’s Boxing Aviary quilt makes beautiful use of print fabrics in an of the moment color scheme. Here’s what Erin had to say about herself and her quilt. I am a newer quilter. I just started sewing in February and quilting in late February, early March. I was pregnant on bed rest and was feeling bored. I was very active before getting pregnant and now was forced to stay at home either sitting or laying down. Sure, I have other children to tend to, but they didn’t always need my attention so I needed a hobby!! My mom is a quilter so I asked her to help me make a quilt. I haven’t stopped since! Note: The magazine pattern referenced above was Out of the Box by Catherine Purifoy, from the Spring 2011 edition of Fons and Porter’s Easy Quilts. 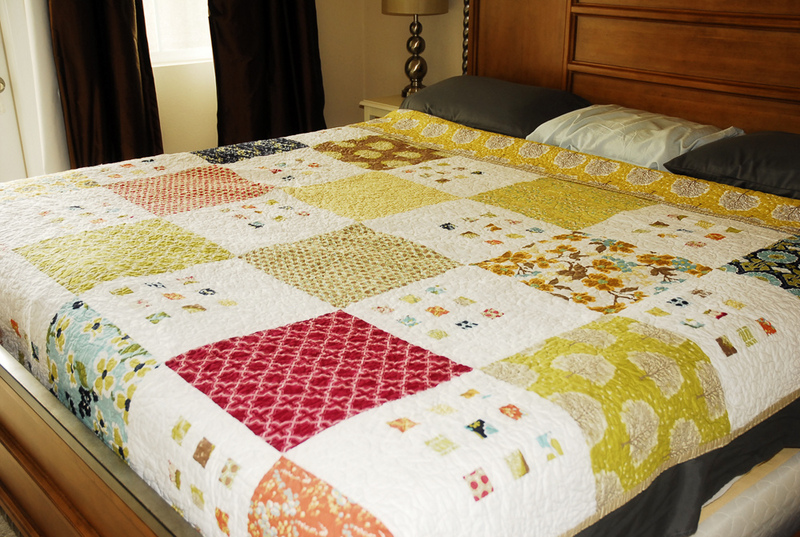 Read more about Erin’s quilts on her blog, Bittle Bear. Ashley Newcomb’s January Flowers quilt uses a fabulous large-scale print and some beautiful quilting to great effect. Read more about Ashley’s work on her blog, Film in the Fridge.